It's a very limited demo, not a game. I imagine compromises will have to be made and I wonder how close an actual game can come. To be honest, I haven't seen anything on nextgen consoles that remotely matches what they showed in this demo. It was actually mind blowing. I think they will. Have you played Beyond? Visually it really is very, very impressive. Now that nextgen has begun and we have a general idea of what is possible and what is not possible on the PS4, do you guys think we can reach this level of ingame visual fidelity? I'm still damned impressed by this demo. All their tech demos pale compared to the games. He brings up some fair points though. In particular the claim that the "vertex density of the 3D models is comparable to the CG used for film making" is some of the most misleading marketing speak I've heard in a while. Watching the demo, it is very obvious that most of the character fidelity stems from texturing, which is why e.g. the sorcerer's face looks amazing in stills but falls way short of film quality CG during animation. The vertex level deformation that's happening does not suggest a particularly dense mesh. I don't doubt that they've built 3D models as dense as those used for feature film. But they obviously only used the high density models to create texture maps and ended up animating low density models. They also make other claims, such as "true 3D depth of field based on an accurate optical simulation". All of these terms can be bent, but looking at their out-of-focus foreground elements I'm not seeing an accurate optical simulation, but rather a fake depth-of-field similar to what's employed by all other games. Their bringing up motion blur is funny, because apart from some particle effects there is no motion blur employed at all in this demo. 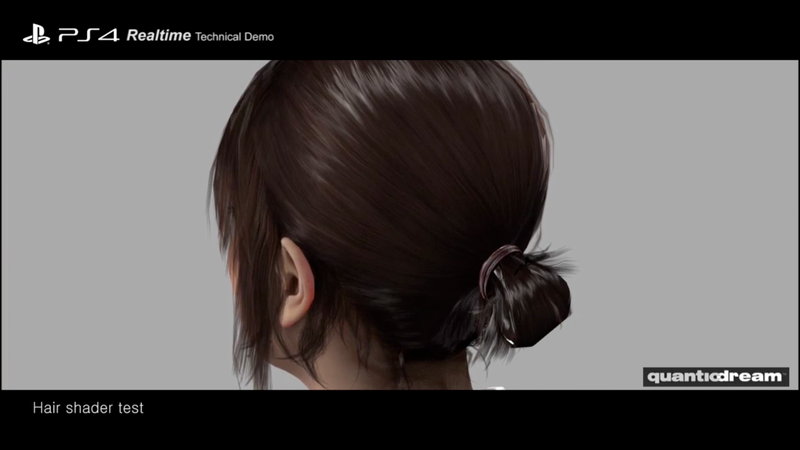 The demo is well made and looks quite cool, there was no need to make misleading statements. Realtime rendering has come a long way, but it's still taking many, many (visible) shortcuts compared to high end rendering. Nice, there's some Ellen Page stuff there too. After a particularly trying shoot (it&#8217;s hard work making people laugh&#8230 , the implementation period began and it was time to start playing with version 1.0 of our new PS4 engine. Then came the first surprise: the graphic quality obtained with relatively little effort was a spectacular improvement on PS3. We obviously expected this, going from the tech specs, but it&#8217;s one thing comparing the number of polygons per second, and it&#8217;s quite another seeing it on the screen. What surprised us first off was the global quality of the images. We are so used to seeing games in 720p (the standard on PS3) that we had forgotten how much full HD (1080p) changes life. If we add better anti-aliasing, HD textures, a real 3D depth of field and of course an avalanche of polygons and lights, we get an idea of the quality that the PS4 can produce. On PS4, everything looks great, because the machine offers power that was totally inaccessible up until now. We can feel that we are closing in little by little on the kind of graphic quality we find in CG films. In the current demo, there are about a million polygons in the set, and a little less than a million per character on the screen (i.e. a total of 4 million when the three characters are on the screen). Each character has about 350 MB of textures and about forty different shaders. It&#8217;s all managed with Physically Based Shaders, volumetric lights, full HDR, Color Grading, Physical Lenses (particularly useful for chromatic aberrations and 3D depth of field), and translucence for more realistic rendering of the skin. The change of set and all the lighting (and the behavior of the shaders) between the dramatic version of the set and the &#8220;studio&#8221; version is done in real time. The same holds true for all pyrotechnical particle effects. The PS4 engine used for Dark Sorcerer is only in its first iteration, and most of the features scheduled for the final version of the engine haven&#8217;t yet been implemented. This demo is only a first test that is well below the visual quality we hope to achieve in our next game. The next game will not be based on this demo, obviously (I know, we&#8217;re a bit weird), but on an idea that is completely different from what we&#8217;ve done to date. It&#8217;s incredibly exciting, and I wish I could tell you more&#8230; but I can&#8217;t.
As I write these lines, I have absolutely no idea what the reactions to Dark Sorcerer will be. What I can say is that it is certainly the script that gave me the hardest time. The idea came very quickly, but then I had to fight with doubts up until it was too late to change my mind. I was ready to rewrite something completely different, something serious and dramatic like Kara, rather than run the stupid risk of writing something that wasn&#8217;t funny. And at the end of the day, I stuck with it. Life is too short to waste time doing boring stuff. Better to take risks and do something you believe in. Both the team and I had enormous fun developing these eleven minutes and transcribing as well as we could the performances of these four totally wacky actors. In a few months, we experienced something between Monty Python and Terry Pratchett (obviously without claiming to match their talent), and we laughed at each projection of the Goblin&#8217;s antics and the growing annoyance of the Sorcerer. We learned how attempting to produce beautiful images with such computing power is painstaking, how each second has to be worked out in minute detail, how light and shade became essential, how difficult it is to raise a smile. To conclude, the whole team and I hope you like Dark Sorcerer. We put our hearts and souls into it, and we are happy to share the result with all those who keep track of and appreciate our progress. I hope you enjoy those eleven minutes as much as we enjoyed creating them. If you smiled even once while watching this short film, our work has been worthwhile. And lastly, a big thank you to all those who have stayed with us, write to us, come to meet us at conferences and fairs, to all those who buy our games. It&#8217;s your support that enables us to continue to create and experiment. I think all the effects and lighting in the demo will show up in PS4 games later (i.e subsurface scattering, volumetric smoke, eye shader, cloth physics). The million polygon characters might be the trickiest part. There's a presentation slide floating around for Uncharted 4 and it says tessellating an entire character is still very taxing (you can only tessellate the silhouette features but not the entire surface area of the model). Maybe for a game that literally has 2 characters on screen and takes place within a small draw distance, it wont be much of a hassle. Would love for both Kana and The Dark Sorcerer to turn into games. I know they won't as most of graphics demos don't. Very interesting concepts for both + dat Cage emotion! Would be cool if you could toy around with it. Change camera, lighting, pause etc. The graphics are definitely great but camera angles allow great control over what we actually see. The more important thing is how entertaining that was - bravo! Guerrilla did it for the Killzone 2 advert but it'd be great if more devs could spare a little time to polish up their tech demo for public release, especially at the start of a new console generation. A game like Beyond or Heavy Rain would. Yeah I would really like to see this. Go play Beyond Two Souls on PS3 and you will know that this can be reached on the PS4. Should be the best looking game on PS4 at the time, no doubt. Just hope the story is less serious than HR and Beyond and more satirical like the Dark Sorcerer demo. despite the pretty graphics, is this going to have gameplay similar to heavy rain and two souls? Yeh, Heavy Rain was a bit depressing and Beyond wasn't exactly cheery, hopefully it can be a bit more lighthearted. Looking so forward to this ! Having seen The Order I say yeah this is going to happen on the PS4. 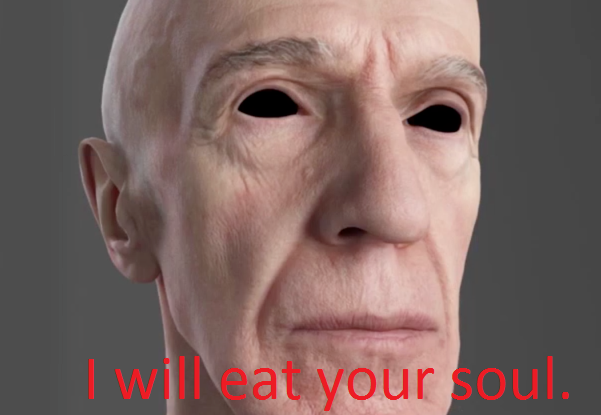 Most thought that first E3 trailer for The Order was pure pre-rendered CGI type stuff. But then the next trailers drop and it is all in-game graphics. That was mind blowing enough for me. I think it would be interesting if Quantic Dreams ever tries to do a game that is an anthology. Maybe 4 shorter stories with the same core actors. Would allow them to explore different gameplay possibilities and hone their writing with shorter pieces. Yeah, I think that the fact that they reworked a bit on the Ellen Page model might be hinting at a PS4 remaster of Beyond. Good thing! What kinds of ambient occlusion/variables are ES- and DW- ? Something else QD could improve is giving thickness to the Dark Sorcerer's hood when peeling it off. The sheet uncovering in Metro: Last Light is the same, it looks impossibly thin. My exact reaction as well. Games won't look like this on anything. The same way the PS2 had things like the face demo which no game could match. People also thought that they couldn't match The Casting and Kara demos, and yet Heavy Rain and Beyond both topped those tech demos. Exactly. There's no reason QD wouldn't manage to do it, it already runs in real time and their games are hardly different (limited number of characters, mostly small rooms and so on). If they did it in the sorcerer demo, they can do it again in their games. Their games are mostly scenes like that, not open world or shooters. tLoU looks pretty good already with limited hardware and recorded cutscenes. So I see your argument from history and nullify it with one of my own. I'm quite curious to see what their next game is going to be about. Enjoyed both Heavy Rain and Beyond. Maybe a Spy game--been a while since I played a great Bond-style game. The PS2 surprassed all of its tech demos (which were all jaggy messes to begin with). They are definitely looking at episodic content and confirmed recently that they hope to make a game in that format one day. Short stories would fit perfectly into that for sure. Considering the rumours hint towards sci-fi, it's probably serious as well, but I think it will be less depressing for sure. Also they have actual writers helping out now, so I'm sure it's going to be fine. Not sure. I noticed that there is a frame in the video where HBAO is enabled though. I'm pretty sure clothing is going to be a major focus for them as well. They mostly used middleware and tools from Beyond on this one, so improvements regarding physics probably come later once the proper PS4 engine is finalized. Clothing... Man, if RaD can make The Order look like it does while being a dynamic action game, I'm scared to imagine what QD are going to do with their minimally interactive 'sets'. It's going to fry synapses. Also, I see someone beat me to the Douglas gif. Sure. That's why I said "mostly". Clearly it's harder to do in those larger areas. I'd love for QD to do an episodic series on Vita. That would be cool if they released the tech demo on PSN. 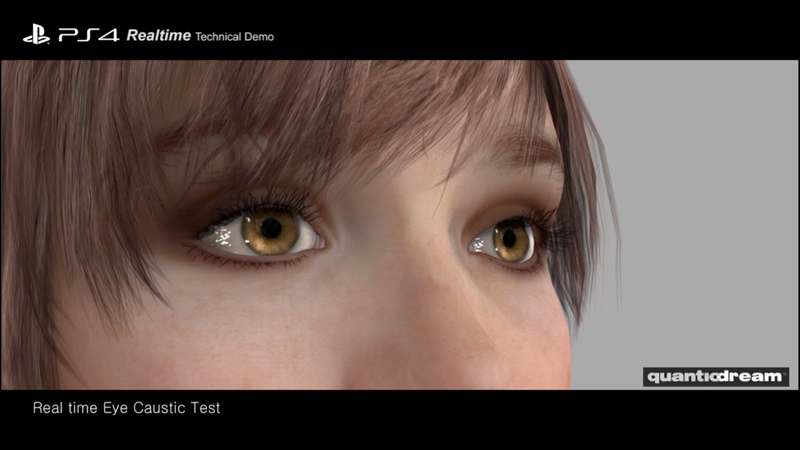 Heavy Rain ended up looking better than its tech demo, and Beyond ended up looking better than its tech demo. I see no reason QD's PS4 game won't follow the trend. The animation and lighting is great. This one is a fixed perspective tech demo meaning there's a small scene to cram with lots of detail. It works for very linear 'moviegames' with lots of fixed perspectives or when the game is made up from very small scenes/maps loaded at any given time. It reminds me of how cinematics are done with fixed perspectives using very little geometry with the scene crafted with the fixed perspectives in mind. QDs previous game Beyond, had decent sized areas and free camera mode through the Aidan feature, so that wasn't and issue there. This was definitely true for Heavy Rain, but Beyond actually does feature some pretty large buildings and environments as well with completely seamless transitions. They are still linear of course, but it shows they can create environments that are typical of corridor shooters and keep up the graphical quality just fine. Especially surprising if you consider that Kara was in a small room as well and then see that many environments in Beyond look a lot better despite being much larger. The only real savings they have is AI and some physics. A sci-fi spy game? Sign me the hell up. Yep! I said the same thing last year and maybe 400 posts ago, and today I still want the tech demo just as bad. Quantic Dream's demos are stand-alone technical works that cannot be found in the final game in any way (and all but Kara have playable test functions with user-friendly controls from E3,) so it would be a phenomenal treat for tech hounds to have them in their homes. Ha! The Quantic Dream's game won't look anything like this. Jokes? 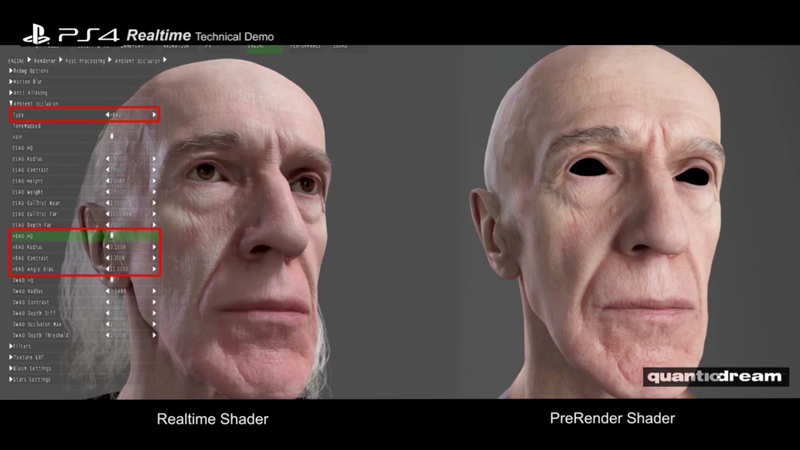 The face in that demo was made up like 100,000 polys(entire models in current gen games will hardly hit this number) and had more bones in the face than you would see in 360/PS3 character faces. The old man, like MGS2 character models, just shows that the guys who made them are great at the trade and were ahead of their time. Technically the old man face demo takes this out back and beats it to death.